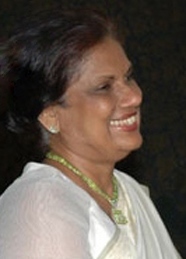 Chandrika Kumaratunga (Sinhala: චන්ද්‍රිකා බන්ඩාරනායක කුමාරතුංග, Tamil: சந்திரிகா பண்டாரநாயக்க குமாரதுங்க; born on June 29, 1945) was the fifth President of Sri Lanka, who served from 12 November 1994 to 19 November 2005. The country's only female president to date, she is the daughter of two former prime ministers and also the leader of the Sri Lanka Freedom Party (SLFP) until the end of 2005. BBC News, "Kumaratunga promises end to hatred", 22 December, 1999. Today is indeed a historic day. It is also a special day in the history of a great people, with a history of over thousands of years. Mr Speaker this Constitution is designed to end the ethnic war which totally destroyed the lives of the people of this country...Though anybody may hoot or howl like jackals, we shall go through with this. ...Mr. Speaker, we are doing this regardless of the number of votes we will get. Quoted by Tamil Nation, "Chandrika's 'Devolution Proposal'", August 7, 2000. Justice Palakidnar Memorial Oration, speech delivered at the Justice Palakidnar Memorial Oration in Colombo, Sri Lanka, on 24 July 2011. Also quoted by BBC News, "Chandrika Kumaratunga berates Sri Lankan government", 25 July 2011. India (even) supported the government of Sri Lanka in another UN resolution in Geneva two years back. So for India having changed its mind this time, there may have been some justifiable reasons. India has been asking the Sri Lankan government to give a political solution. Quoted by Archive.Indian Express, "India's vote against Sri Lanka not 'let down': ex-President", April 10, 2012. The Chandrika government had lifted the embargo on certain goods banned by the previous regime. Vendors in the local fair sold them as Chandrika merchandise. We had Chandrika sarees and bangles. Swaminathan Wimal, quoted on BBC News, What is the Kumaratunga Legacy?, November 19, 2005. Kumaratunga not only boldly said that the ethnic problem needs a political solution but over the years she has been able to convince the majority of this country that the ethnic question warrants a political solution. Gunasekara, quoted on BBC News, What is the Kumaratunga Legacy?, November 19, 2005. This page was last edited on 27 March 2016, at 21:47.